Enjoy a cooler home and lower A/C bills with high-performance, energy-efficient windows from Tight Line. When you’re looking for a window that does more than just open and close, consider a bow window installation from Tight Line! Crafted from several panes of glass arranged in a gently curving manner, bow windows extend out from the exterior wall to create a natural focal point for your home. They also add an alcove that can be used as storage or seating space, making them a practical addition to any room! Not all Johns Creek home windows offer the same benefits, and we at Tight Line are here to make sure you get the perfect window design for your needs. 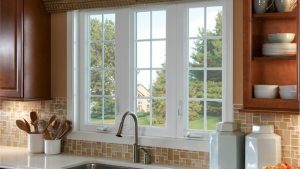 If you want additional ventilation without using a ton of extra space, then double hung windows might be the right choice. With two operable sashes instead of the standard single sash, these windows bring twice the fresh air into your home. A window can be so much more than a source of natural light and fresh air—it can also serve as a miniature greenhouse right in your home! With an installation of our Johns Creek garden windows, you can subtly expand your interior space and create a cozy perch for your herbs, flowers, or plants. Looking for a way to highlight the scenery around your home? Enjoy the beauty of nature from any room by adding a gorgeous picture window! Because these windows do not open, they have a narrow profile and minimal hardware—expanding the view and bringing tons of vibrant sunshine into the house. Why Choose Tight Line for Your Johns Creek Window Installation? Contact Us Today to Start With a Free Cost Estimate for Your Johns Creek Windows! No matter what kind of window installation you have in mind, Tight Line is the local company you can count on for quality replacement windows at affordable prices. Call us today to speak with a local window specialist, or fill out our quick online form and request your free in-home estimate!